Anders, the vocalist, and I, Henrik Engkjær (Guitars), started back in 2005, and recorded a demo in 2007. In 2009 we got a full line-up, which now, besides the previously mentioned, consists of Peter Engkjær (guitars), Søren Bentsen (drums) and Jesper Holst (bass). I’d played with Peter and Søren in my former band, Victimizer, already. 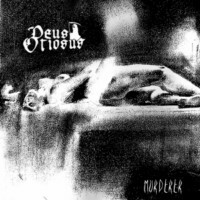 In 2009 Mulligore Productions from Canada also released a split CD between Deus Otiosus and Hideous Invasion, which by the way involves some of the other guys from the band. In 2010 we have released our debut album, "Murderer”. The labels behind this one are American Line Productions and FDA Rekotz. I would describe it as death metal. To be more precise: Old school death metal moving forward. Some people have pointed out thrash and black metal elements in the music, but that’s not really important. We are creative and don’t believe in neither narrow genres or lobbing every single note or beat into a genre. I can’t remember which bands I was inspired by in the beginning, but a lot of death metal classics I would say. From current bands I find Absu and Macabre most inspiring. Both have unique musical styles and great songwriting talents. Both are very underrated too. He should only do so if he finds the music good. So in this age of world wide web it’s only a matter o giving it a listen. If somebody likes us however, it will most likely be because he recognizes an own identity, that we actually write songs you might remember, and that each song has it’s own character. He might also see that we are an old school band without being a creatively bankrupt rip off of past glories. We’ve had good and bad reactions as is to be expected. I think many have gotten used to listen to metal in a certain way, and won’t be able to get into Deus Otiosus easily. If you’re mainly music because it’s a given speed, genre, cult-status, production, technical standard or whatever, you probably won’t get anything out of it. If you’re looking for good music, good songs, and find these qualities scarce in metal today, there’s a chance you might like it. Yes, we play live as well. Our live activity has been limited to Denmark, which is OK for now. We’ve had some offers to play Germany, but it has been possible unfortunately. They shouldn’t know anything at all. They should simply listen to it like anyone else. However if they are interested in old school death metal and still believe in songwriting and individual identities there’s a greater chance that they will find it interesting. The South American version of the "Murderer” album is out now, and the world wide version will come soon. This means will hopefully play a couple of gigs the next year; a few things are in the works, but nothing is certain yet. There will also be a Compilation DVD from this year’s Kill-Town Death Fest, which will feature us playing the song "Murderer” live at this year’s festival. Finally we will continue writing and arranging music for a future album or other release.